Guns Save Life’s motto is simple: “We defend your right to defend yourself.” So when we saw Deerfield, Illinois amend a local ordinance to ban America’s favorite rifle and many similar guns, we didn’t sit around and complain. We took action. We’re pleased to announce a lawsuit challenging the Village of Deerfield’s gun confiscation ordinance. After all, the newly amended ordinance clearly violates the constitutional rights of not only Deerfield residents, but any visitors to the community and those just passing through. The change even stripped out language that granted immunity for those using one of these guns for lawful self-defense. The AR-15 stands as America’s favorite rifle for a number of very good reasons. People young and old can effectively utilize the AR platform for competition, recreation and self-defense. Yes, guns protect families. Guns protect children. Banning one of the most effective guns widely in use by America’s nearly 100 million gun owners will only serve to protect criminals, lunatics and terrorists. Particularly when it comes to women and teens, Uncle Joe Biden’s sage advice to just buy a shotgun stands as seriously ignorant. 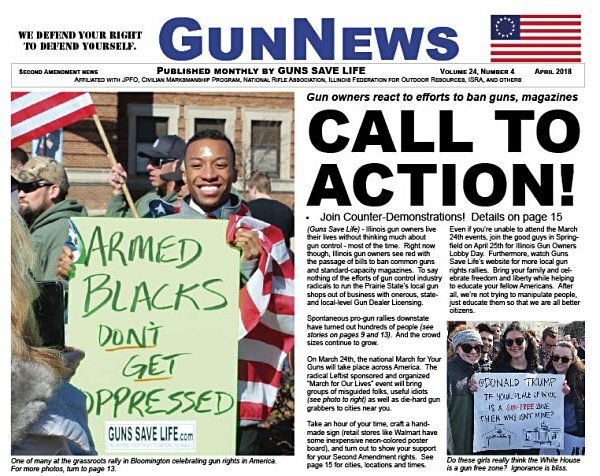 We also publish GunNews (current issue here available for download) each month. The Deerfield ordinance needed to be challenged. Guns Save Life, with the assistance of our friends at the National Rifle Association’s Institute for Legislative Action, has filed suit to stop this unconstitutional move by a local government in Illinois. This latest court action represents GSL’s second civil rights lawsuit against unconstitutional local ordinances in the Land of Lincoln. We’re also a party to Guns Save Life v. Ali, a suit challenging Cook County’s gun and ammo tax. That suit remains ongoing. Fairfax, Va.— The National Rifle Association Institute for Legislative Action (NRA-ILA) today announced support for a lawsuit brought by Guns Save Life challenging the Village of Deerfield, Illinois’ gun confiscation ordinance. The lawsuit challenges Deerfield’s recent attempt to criminalize so-called “assault weapons” and “high capacity magazines” within village limits. By amending an existing 2013 ordinance, the Village Board of Trustees has now empowered local authorities to confiscate and destroy all so-called “assault weapons” and “high capacity magazines” possessed within village limits. The amendment also imposes a daily fine ranging between $250 and $1,000. “We are going to fight this ordinance, which clearly violates our member’s constitutional rights, and with the help of the NRA I believe we can secure a victory for law-abiding gun owners in and around Deerfield,” said John Boch, executive director of Guns Save Life. This entry was posted on April 5, 2018 at 11:11 am and is filed under Blog. You can follow any responses to this entry through the RSS 2.0 feed. Has GSL sought a restraining order preventing the implementation of this ordinance until the lawsuit is settled? Wasn't there a pre-emption enacted in 2013 along with concealed carry such that localities were not allowed to enact such ordinances? 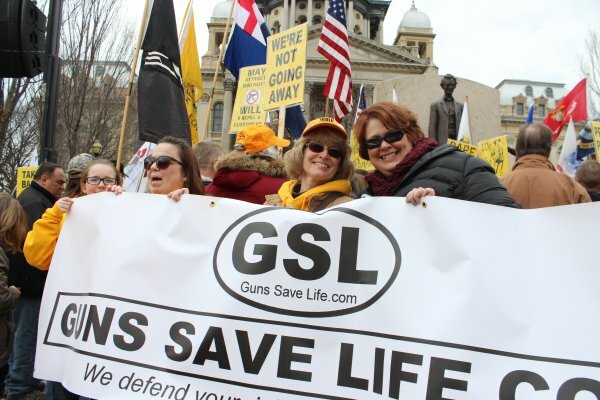 Thank you GSL.. Way to take the the bull by horns..
Perhaps, we NRA members and the millions of law-abiding gun owners in this country, should have our own march on Washington, to show our support for the Constitution, Bill of Rights and our 2nd Amendent! – Enough of hearing and seeing, Black Lives Matter, Antifa, NOW, Planned Parenthood and all those other liberal, leftist, anti-America groups. – It is time for the SILENT MAJORITY (that’s us NRA) to take a stand, like we did in the past election. NRA members and others shouldn’t expect President Trump to do this by himself! – America needs to hear from real law-abiding Americans who support our Armed forces, Police Officers and the USA! well I just saw Mr Bock on 5 o’clock. WGN. News. Great. If we can help in any way let us know I for one can help in some way. Thanks for doin a great job. I didn’t think they could do that ( legally ). When I heard what they did !!! Where is this lawsuit being brought – state or Federal court? If state, in which county? The audacity of these Nazi's! I HATE Illinois Nazis! –Jake, the Blues Brothers. "It started as a twisted dream by the Village of Deerfield…and ended in a shattering…LAWSUIT!! –Time-Life WWII Book Series commercial. Saving this video to my phone in case utoob deletes it. Here is the Communist Rules for Revolution from 1919. Read the Bottom part "C"
The link didn't work for me, look up Karl Marx's Commie manifesto or Alinski's "Rules for Radicals", I'm sure it will be similar to what you want to convey. If this doesnt work then i apologize. I went into the "Twilight Zone" dark side in Champaign at the "student's" "Town Hall for our LIES" at the Champaign 'publik liberry' where the "moms", everytown, the children of local skools and U of I, B.Londrigan, and many other anti-constitutionalists spoke addressing CRIMINAL violence perpetrated with a firearm (according to them "gun violence"), when the subject of the Deerfield anti-constitutional ordinance was brought up, there was much clapping and shouting (in favor) and it about made me hurl. These people are rabidly anti-firearms to the extent that they want to eliminate the second amendment while spouting they don't want to "take your guns" ….BULL MANURE, THAT IS EXACTLY WHAT THEY WANT TO DO AND IT IS APPARENT IN ALL THEIR ACTIONS, THOUGHTS, AND DEEDS! Watch for an "after action report" in a letter to the News Gazette letter forum, hopefully to include it in the Gun News if possible. Due to the recent headline regarding people using cars as killing machines next on the agenda from the lunatic left with the exact same logic applied: Any car that looks like a military vehicle such as a Jeep or Hummer that has an Automatic Transmission that makes the car go faster simply by holding your foot on the gas pedal must be banned,,,which of course would then ban virtually all cars that have an automatic transmission. Citizens will have 90 days to sell or bring in to the local authorties or we'll call in an airstrike and blow it off the face of the earth! This includes any and all that use our roads even if they're just passing through. First, If I didn't thank GSL for the lawsuit in my earlier post, I should have. Thank You. Is the GSL/NRA lawsuit(s) different in any material way (perhaps the grounds for the lawsuit?) than the ISRA/GOA lawsuit? Are different law firms involved? I am also trying to find out if either set(s) of lawsuits is also seeking a restraining order against the implementation of the ordinance until such time as the law suits are resolved. The ISRA/GOA's lawsuit is available on-line, but I cannot find the GSL/NRA lawsuit. Most of the Chicago papers and their copycats acknowledge the ISRA/GOA lawsuit but not the GSL/NRA lawsuit. Should we as members of GSL/NRA make some attempt to correct this oversight, or is there some strategy recommending a lower profile? Is this lawsuit still moving forward? Where can we find a copy of the complaint?